Salado Eagles will face Pilot Point at 6 p.m. today (Dec. 2) as both teams have notched two wins in the early rounds of the Coach Smith Memorial Basketball Tournament. Pilot Point will then face the Jarrell Cougars at 9 a.m. tomorrow (Dec. 3) as they have each notched two wins. Old foes Salado and Jarrell will tip off at 3 p.m. tomorrow (Dec. 3) in what could determine the winner of the Coach Smith Tournament, depending upon their outcomes with Pilot Point. The Eagles have already notched wins against Central Texas Christian School (46-36) and Bruceville-Eddy (53-34). Meanwhile the Cougars have beaten Leander Glenn 53-14 and Thorndale 69-31. Pilot Point has two wins, beating Travis 53-44 and McGregor 67-42. The Eagles cruised past CTCS 46-36 yesterday, developing a commanding 24-13 halftime lead. Jeremy Jarvis led Salado with 10 points. He was 4-of-6 at the free throw line. Willie Whigham followed with 8 points, shooting 2-of-4 at thre free throw line. Also scoring for the Eagles in the game were Ryan Kyburz, Evan Wall and Anthony Young, 7 points each, Anthony Pittman, 3 points and Trevor Stump and Kade Maedgen, 2 points each. with 21 points coming from beyond the three-point arc, Salado Eagles beat Bruceville-Eddy 53-34 in the second round of the Coach Smith Memorial Tournament. The Eagles led by 15 at the hald, 32-17. Salado held Bruceville-Eddy to just 2 points in the third and rode the lead to the win. Trevor Stump hit three 3-pointers and led Salado with 15 points. Anthony Pittman also had three 3-pointers in the game and scored 14 points. Anthony Young scored 9 points in the fourth quarter and had 13 points in the game. Also scoring for the Eagles were Ryan Kyburz, 5 points, Kade Maedgen, 3 points, Willy Whigham, 2 points and Jeremy Jarvis, 1 point. 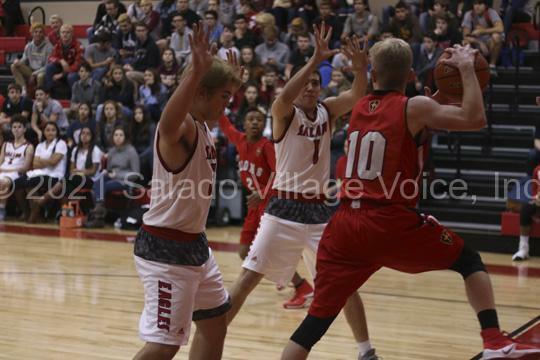 Prior to the tournament, Salado staved off the Rogers Eagles to win in overtime 42-39 on the road Nov. 29. Notched at 37 at the end of regulation, Salado scored 6 points in overtime for the win. In a low scoring first, Rogers led 9-5 but the Eagles scored 15 points in the second to take a 20-17 lead. Both teams struggled in the third and Salado took a 28-21 lead going into the fourth quarter. Anthony Pittman hit four 3-pointers to lead the Eagles with 12 points. Jeremy Jarvis followed with 10 points. Also scoring for the Eagles were Ryan Kyburz, 7 points, Evan Wall and Anthony Young, 5 points each and Trevor Stump and Kade Maedgen, 2 points each.